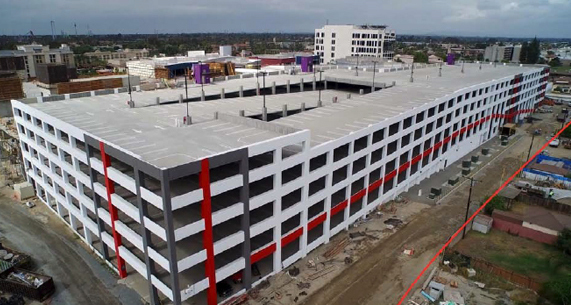 Klorman Construction was the design/build general contractor for this six level, 1,710-stall parking structure for The Source a 500,000-square-foot major mixed use retail center, office, and hotel complex in Buena Park, CA. The project is a landmark development for the city and is a premier destination, featuring a wide array of shopping, dining, and entertainment. The multi-story development features unique and energetic contemporary design with state-of the art electronic imagery. The parking structure, was built using the Geopier system, a unique site improvement method and technology that is designed to strengthen soft soil locations. Additionally, the parking structure features double-sided door elevators and varying parking level heights to accommodate the varying retail building floor heights.